Through the looking glass: This fan-made Star Wars showcase demonstrates what a modern remake of Dark Forces could look like using the Unreal Engine 4. Best yet, the first level is downloadable and playable although don't expect EA / Disney to let that be the case for much longer. If you want it, you'd better grab it ASAP. 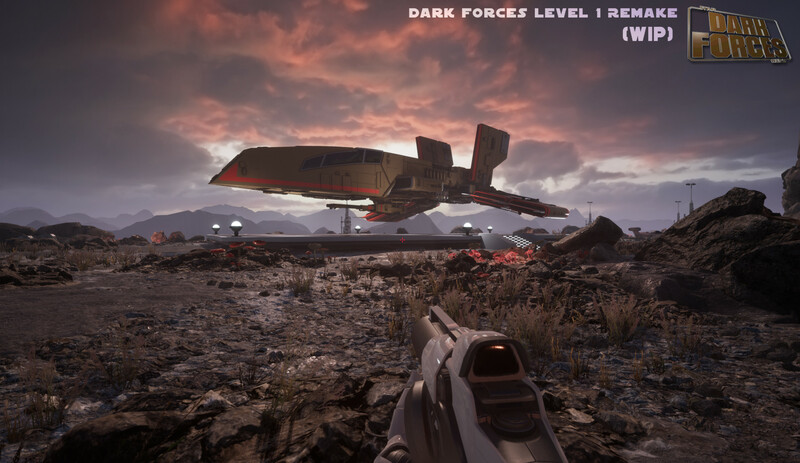 It’s been a little over a year since Jason Lewis, senior environment artist at Obsidian Entertainment, shared screenshots highlighting the progress made towards a remake of level one of Star Wars: Dark Forces. Fast-forward more than a year later and YouTuber Bluedrake42 has managed to get his hands on a playable demo of the project. Titled Star Wars Docking Bay 94 Mos Eisley, the demo was built in Unreal Engine 4 and looks rather incredible, especially considering it was done in someone’s spare time. There are no enemies or objectives in the demo but don’t let that discourage you; there’s plenty to explore and marvel over. The bigger the Star Wars geek you are, the more time you’ll likely spend combing over the environment. Yeah, it’s that good. While Lewis is quick to point out in the disclaimer that this is in no way related to Star Wars, it does give you an idea of what a modern Dark Forces remake could look like if given the right amount of attention. I’m personally curious as to the age of the demo. The aforementioned disclaimer that loads at the beginning of the demo references some older graphics cards including the GTX 760, GTX 970 and GTX 980 Ti.